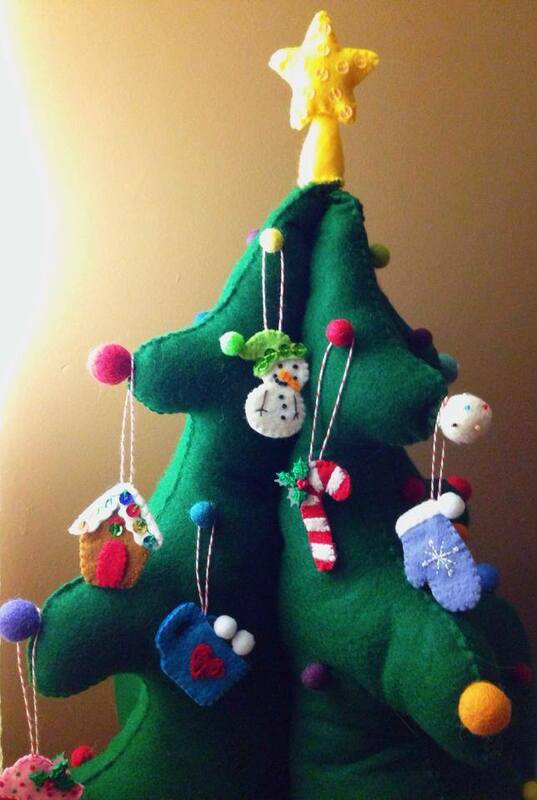 25 days of Felt Christmas Crafts Day 2 No sew Felt tree. 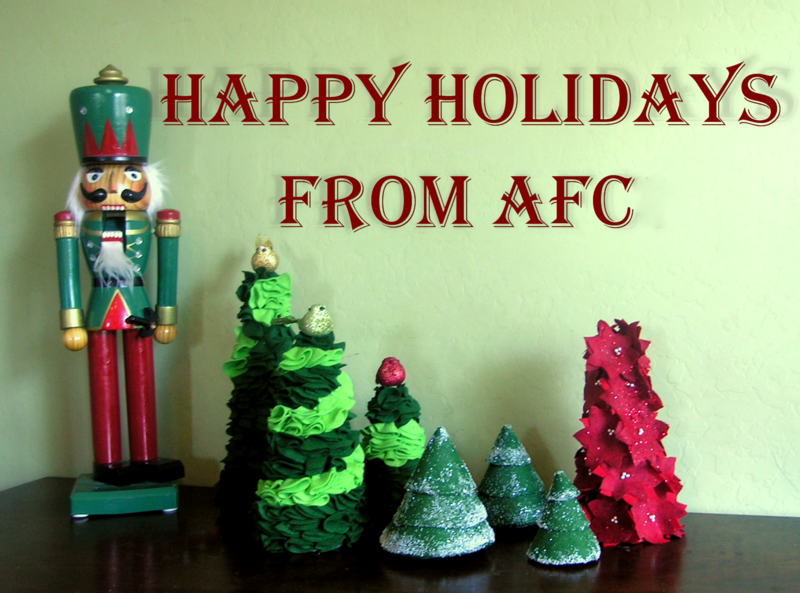 Few things say Christmas crafting as much as felt. 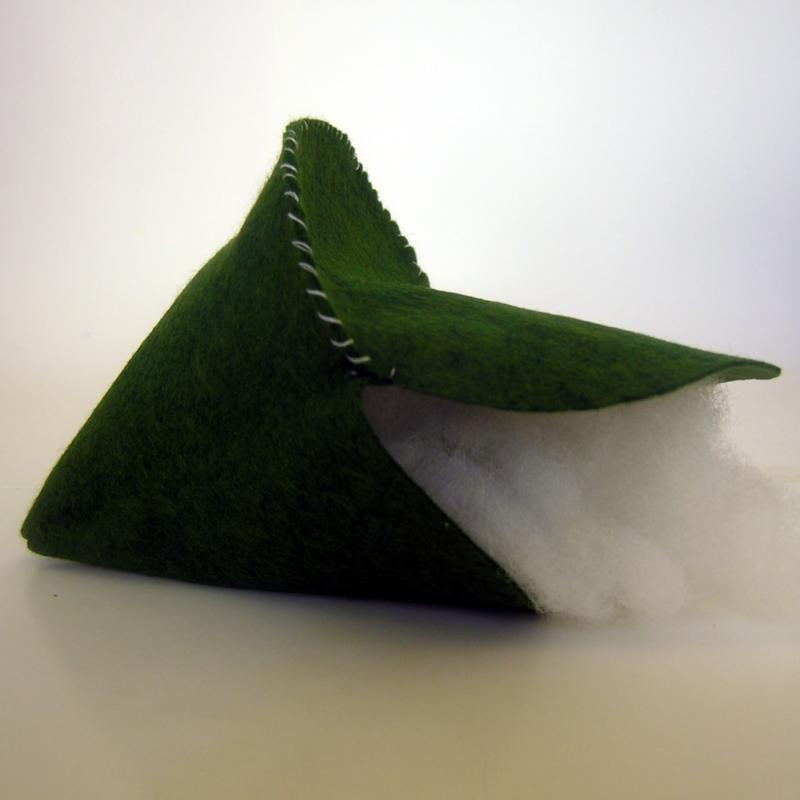 Felt is a perfect medium for nearly every Christmas project. 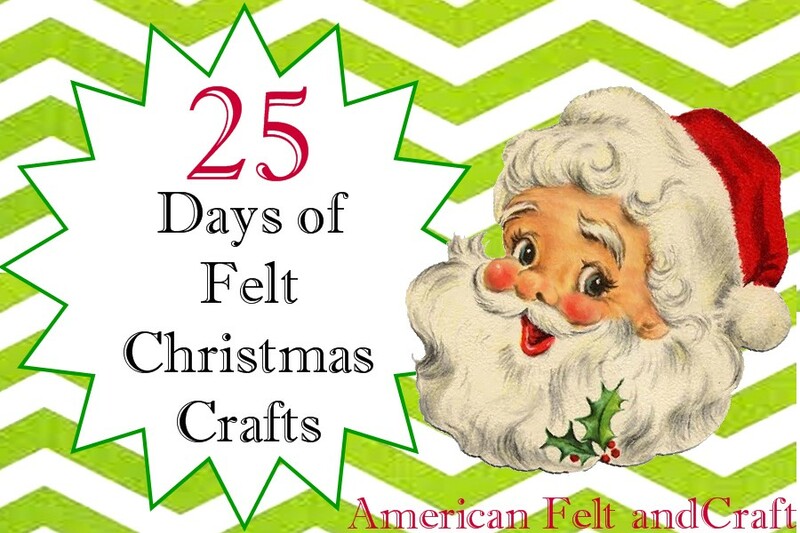 Lest you doubt this I will be featuring free felt Christmas crafts and templates from the blogosphere for the next 25 days . 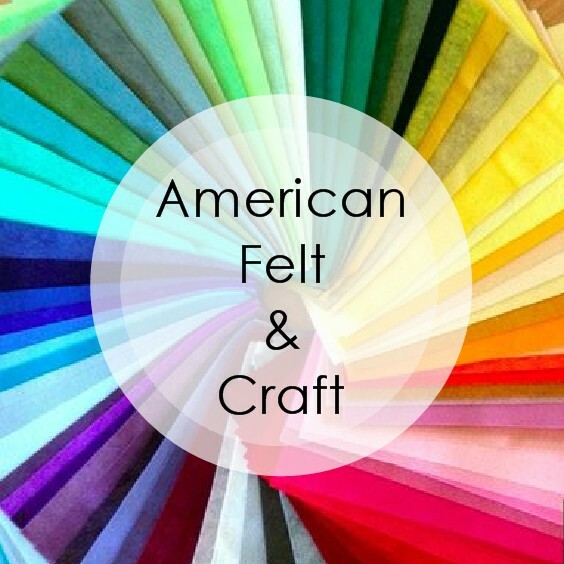 So sharpen those scissors break out that felt stash and craft along. 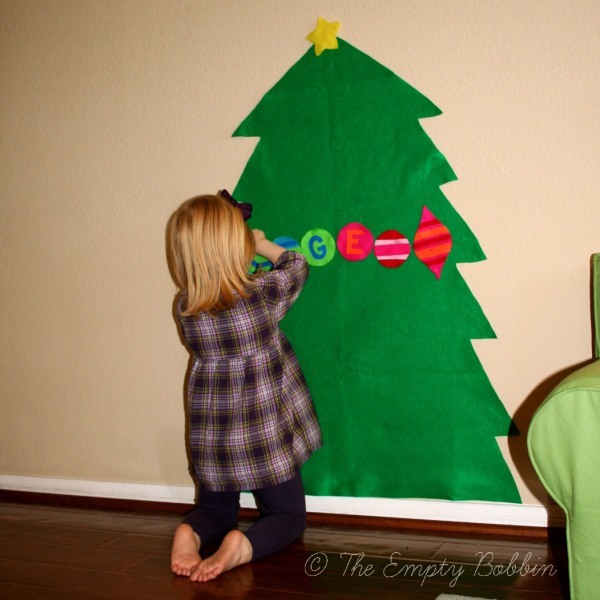 Isn’t this toddler tree adorable?? And it can be made in 1 naptime! 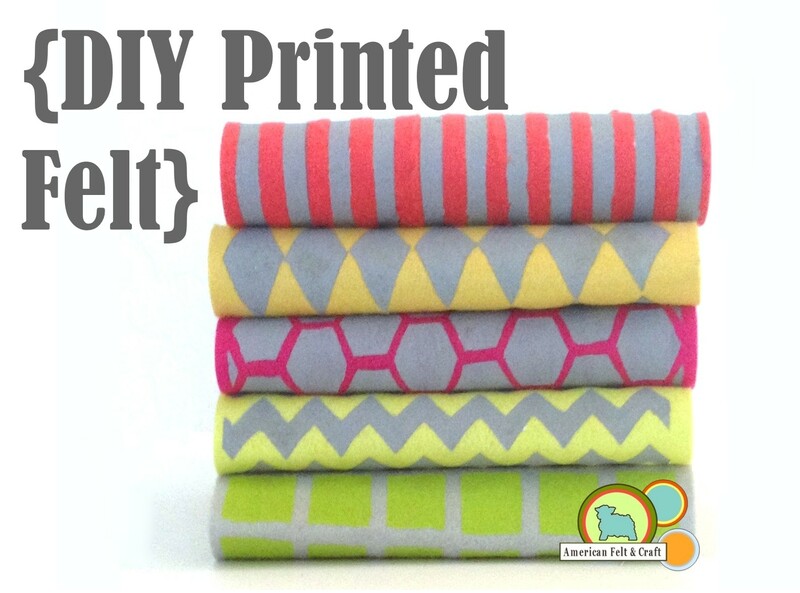 And… wait for it…ITS NO SEW! 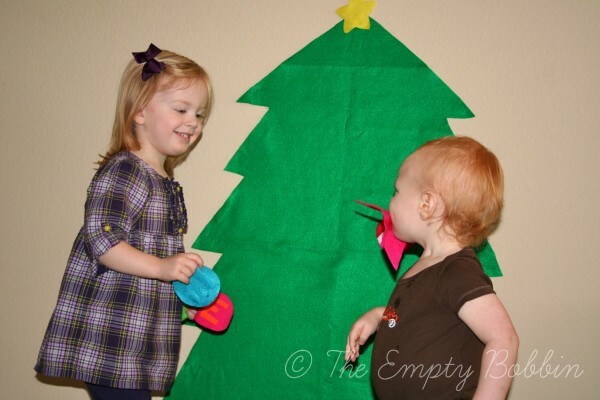 This year I knew I wanted to do a tutorial for a felt Christmas tree on our blog. 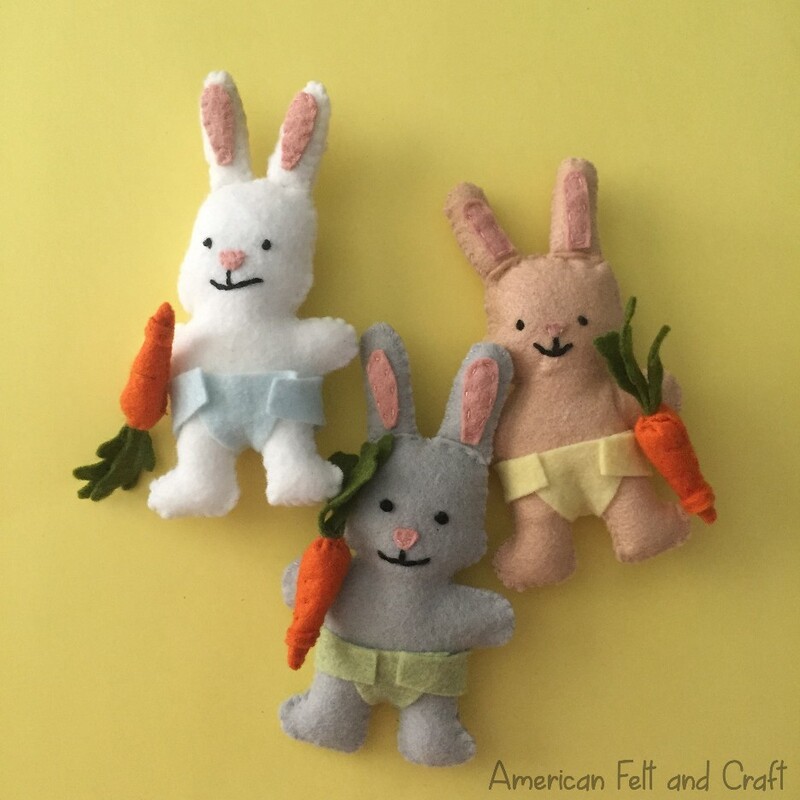 I quickly got to work and whipped up three sweet little trees, however my mind began ruminating on another idea, so of course I had to at least try it out… and while finishing that one up I had a great idea for three more! Well not one to ignore inspiration I worked out the logistics on the others and made them too! Picking just one to showcase on the blog this month was tougher than I expected so I decided to get more opinions. When I showed my handy work to my brood, my daughter ooohed and awwed, of course she has a real appreciation for anything that sparkles. And my son piped up to ask if these were the reason we had to have spaghetti twice in one week. And I am proud to say they are! And they were worth it! The projects themselves aren’t really all that time-consuming unless you are trying to design tree styles, make templates, shoot tutorials, make them all and shoot the finished product all in 2 days, in which case you may want to stock up on spaghetti sauce! And don’t forget to tell us which is your favorite by leaving a comment here or posting on our Facebook page. One person will be picked randomly to win a set of the adorable bird picks like those used in the project! Hurry contest ends December 17th at midnight. Winner will be announced December 18th, contest open to U.S residents only please. Begin by cutting out template pieces. 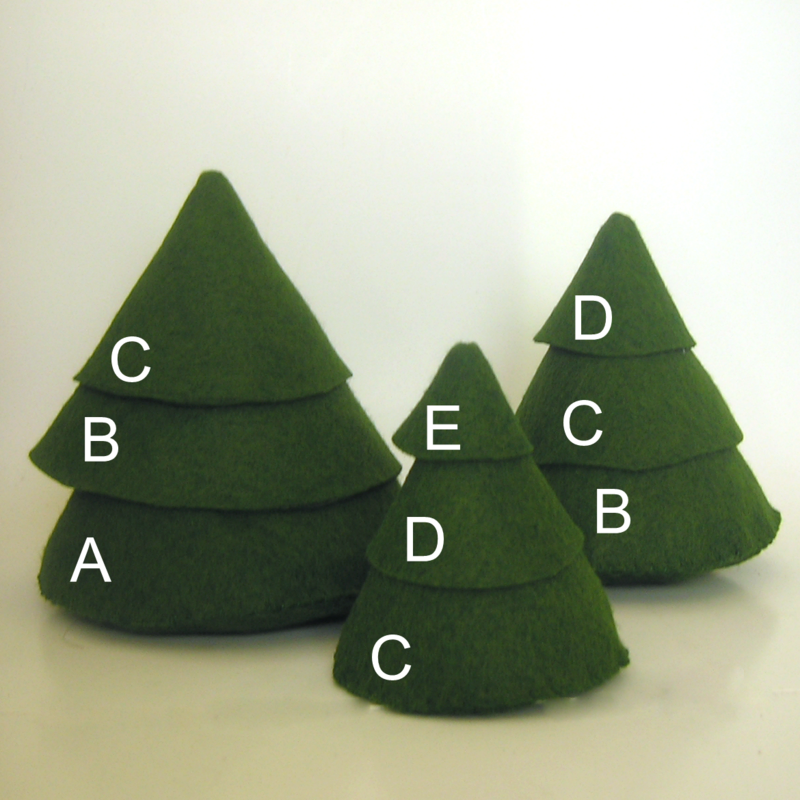 You will need 1-piece A & E 2- pieces B and D , 3 – piece C, as well as the base of each of tree. Turn each of the template pieces so the stitching faces inward. You will be working with one template piece A 1 template piece B and 1 template piece C. Set all other pieces aside. Using an overcast stitch attach the largest base to 1 A piece, stopping when 3/4 of the way done to stuff. Then sew closed. 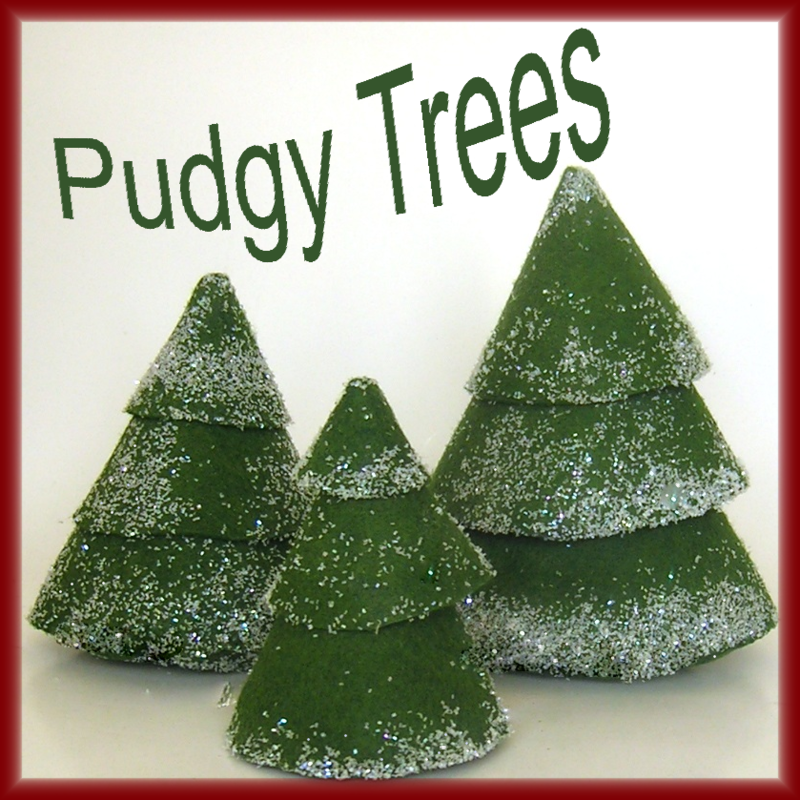 * You may need to trim the base piece down a bit depending on the exact size of your tree. Repeat with one B to medium base and one C to small base. 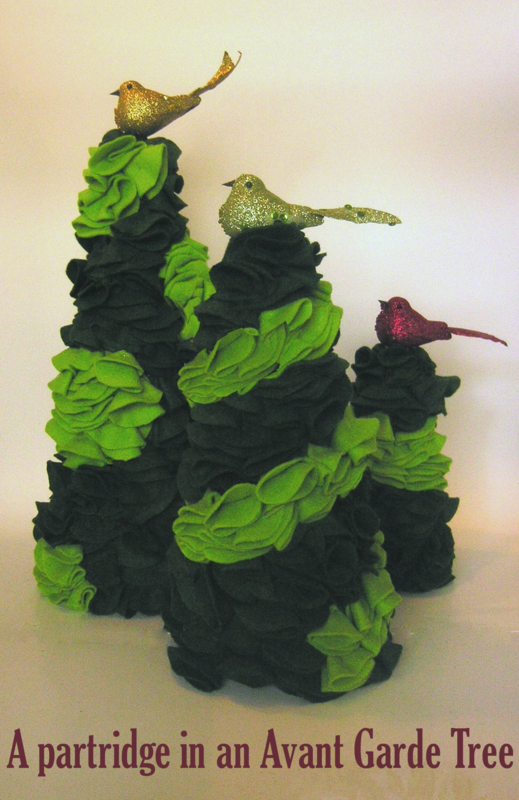 Stack unstuffed pieces C and D onto stuffed piece B to create medium tree. These trees are both whimsical and a bit sophisticated, they are by far the most time consuming of all of the trees but I think they are worth the time. 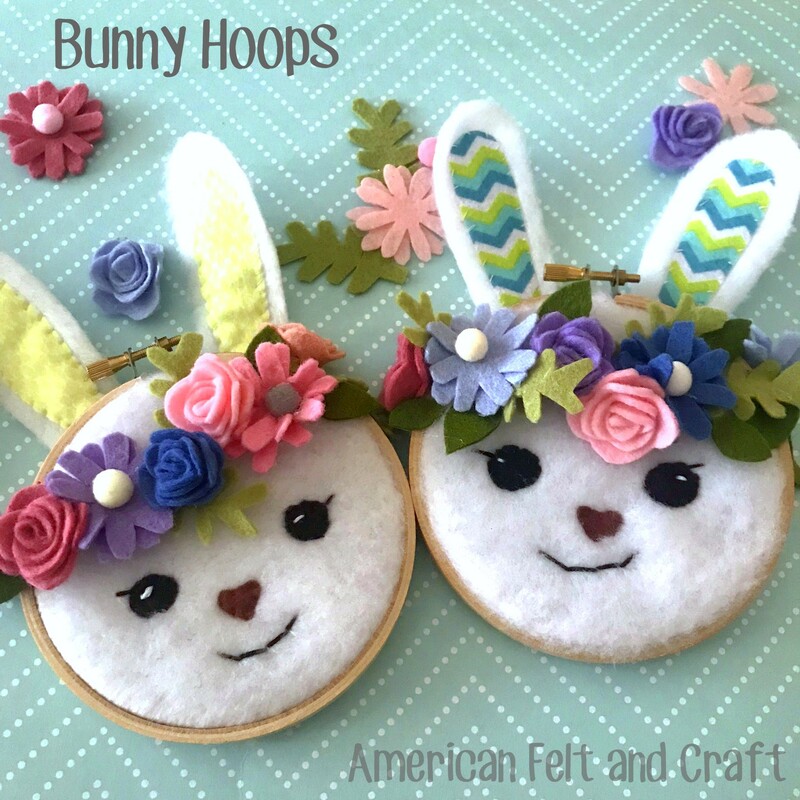 Cut circle template from both felt colors (piece F in the PDF download) it is impossible to give you an exact number since tree sizes will vary as well as placement technique but let me just tell you it will be A LOT! 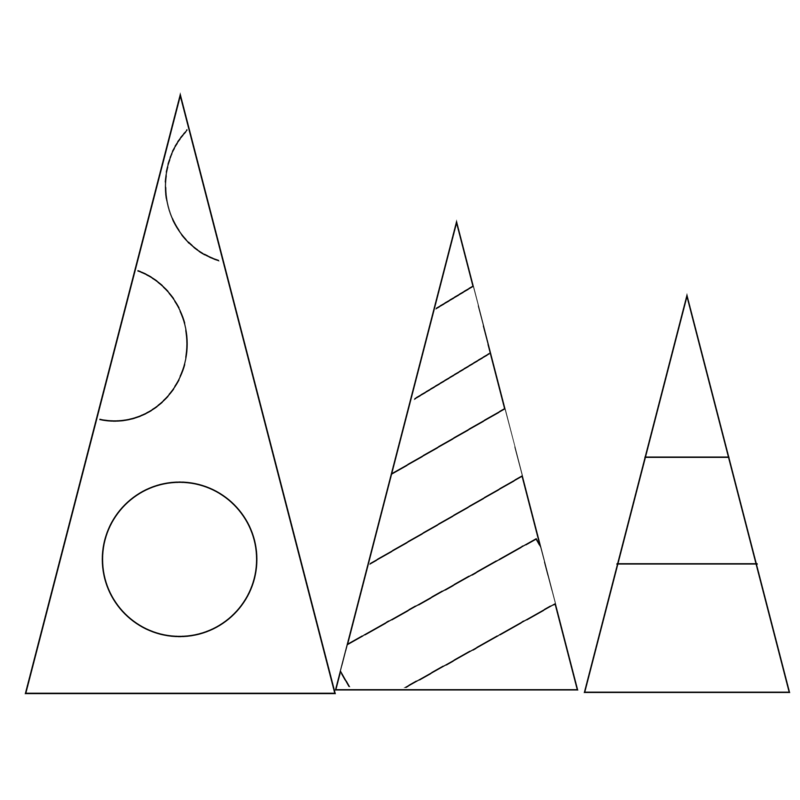 Please note circle shapes don’t have to be perfect but they should all be around the same size. Since you will be cutting a lot you may want to free hand them. 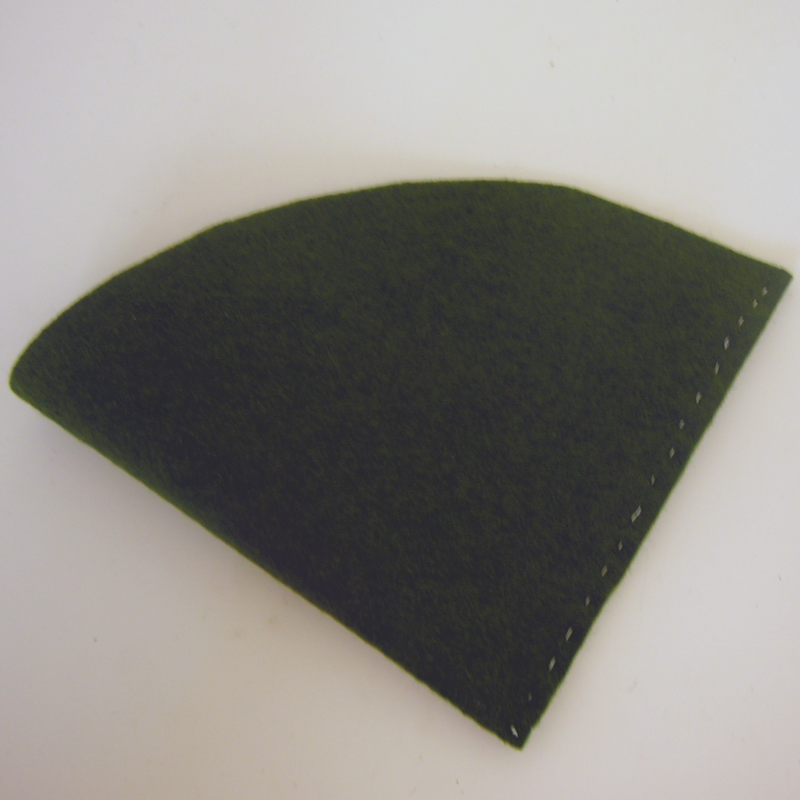 Map out the design you intend to use for trees by pinning scrap paper in the areas you want the lighter felt to be, this will ensure you will not accidentally cover them with the wrong color of felt. Here I did a large polka dot, a swirl and one broad stripe but you can do just about anything you can dream up. 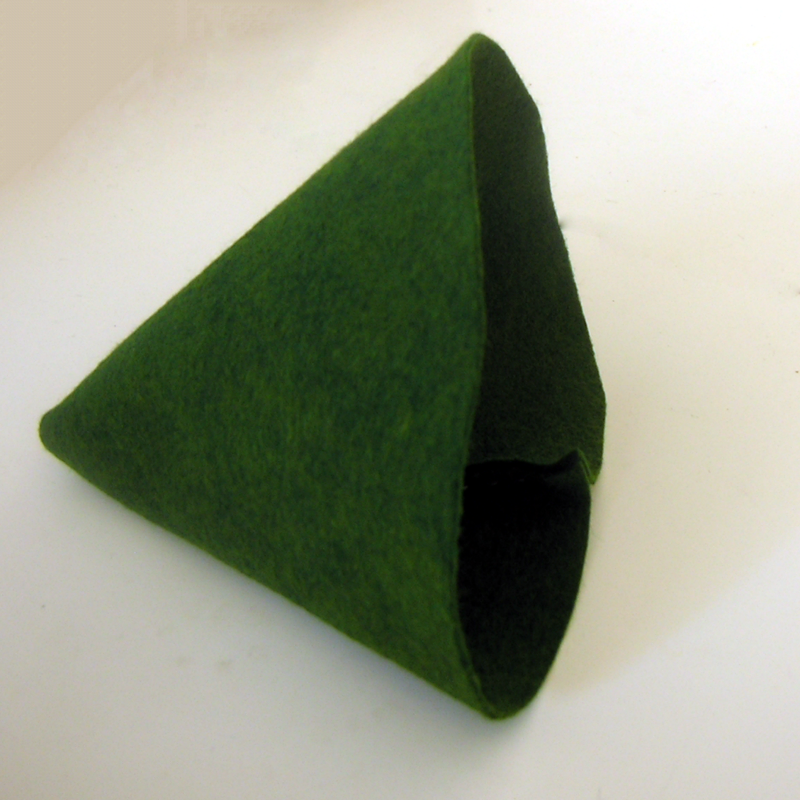 Begin by folding circles in half, then into quarters push a pin through and place along the base of the tree with the poofy end facing downwards. Cover the bottom row along the base of the tree before moving upward this will allow you to cover the pins of the bottom pieces with the next piece. 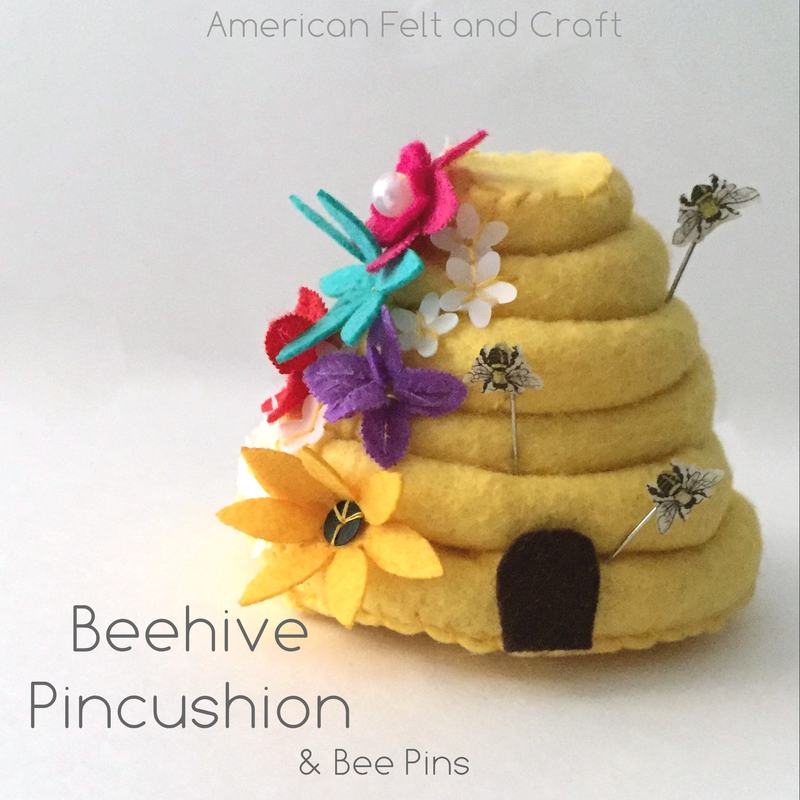 When you get to the design it may be necessary to angle pieces so that the design can be clearly pinned. Complete all of the darker parts of the tree before moving on to the design. Note used lighter felt to mark my design for clarity but paper works just as well. After you have covered all but the paper design go back and begin to cover it in the same way you covered the rest of the tree. 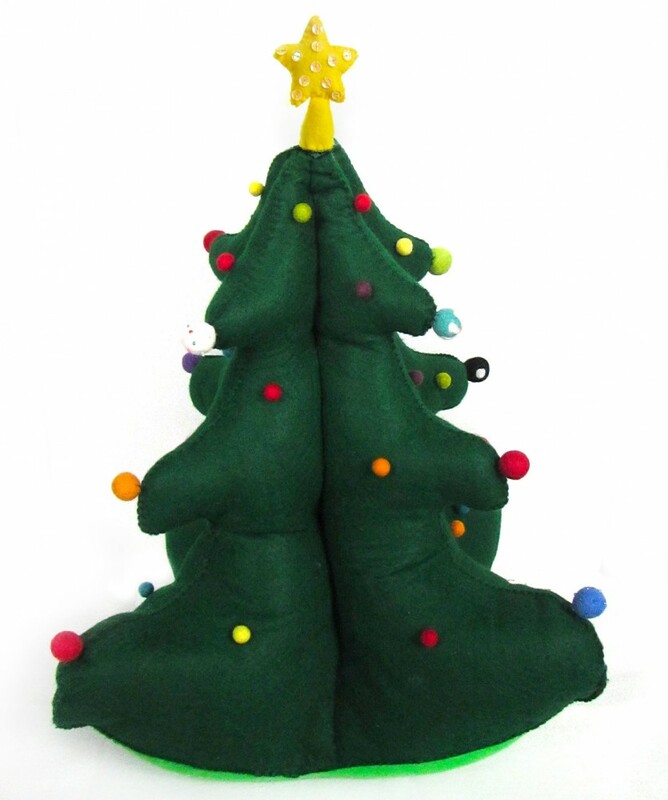 Once complete look over the tree and puff out any areas you need to in order to better hide pins. Repeat with remaining trees. Insert picks into the top of each tree you may need to cut the picks to a smaller size first. 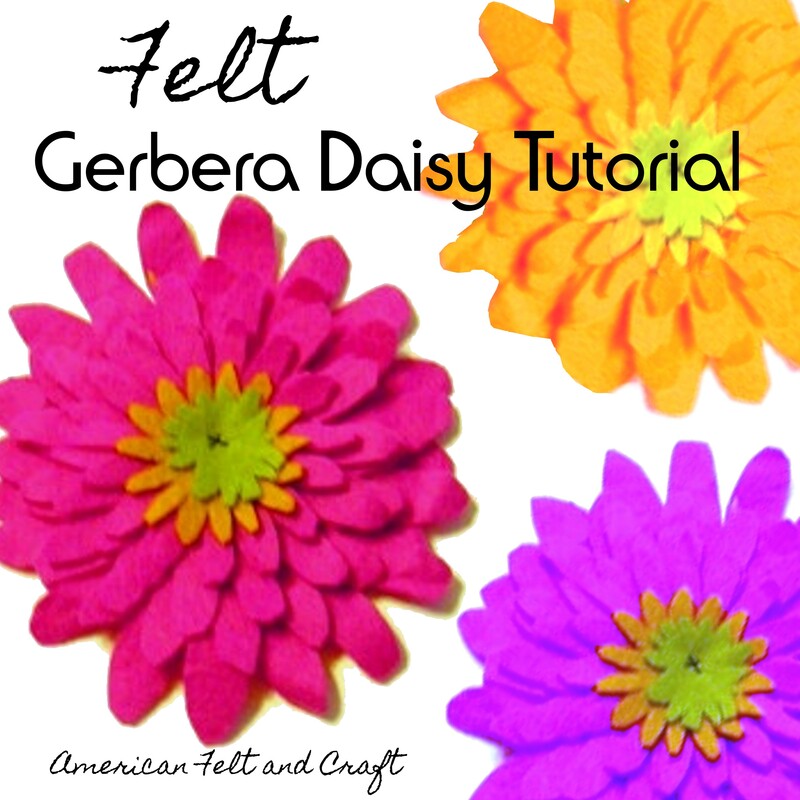 Cut out poinsettia templates (marked G in the PDF file) from the colored felt. Approx 33 of each color. 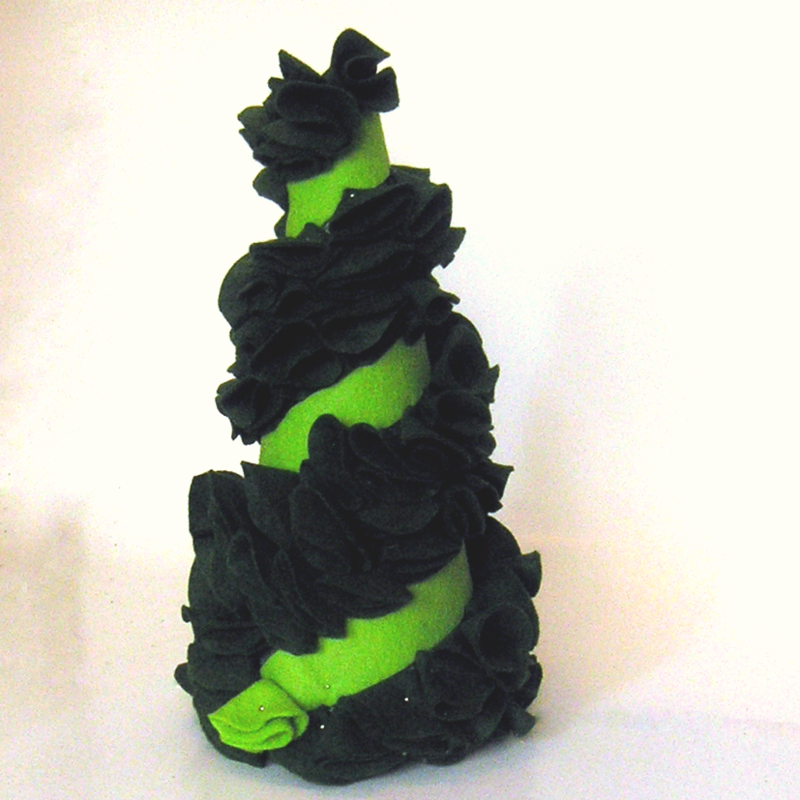 You may need more or less depending on the size of your foam tree. If you’re planning on using glitter lightly brush the darker red pieces with glue using the foam brush. Sprinkle glitter onto pieces and allow to dry. 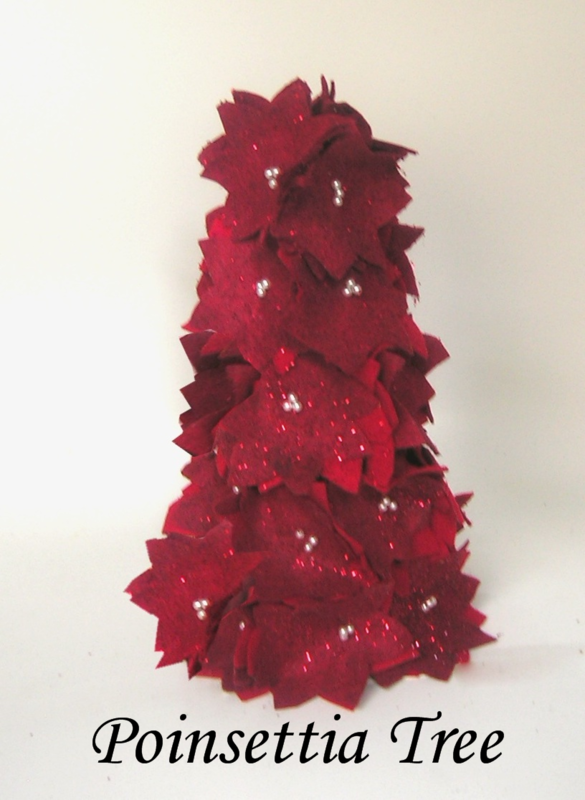 Stack the darker red poinsettia pieces on top of the smaller poinsettia pieces. 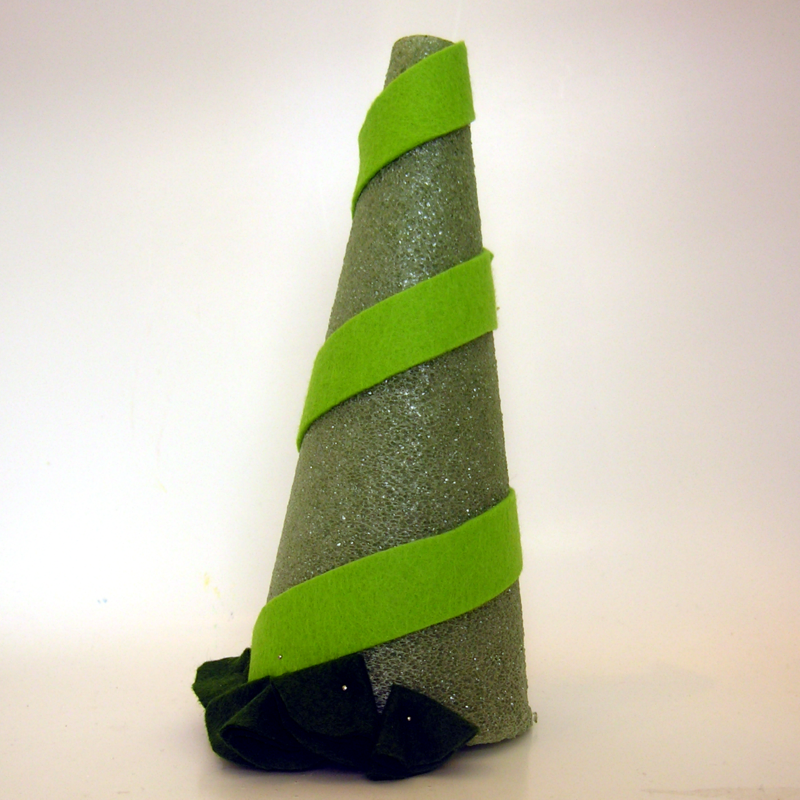 Place onto foam tree starting from the base, push three pins into the center of each flower to secure to tree. 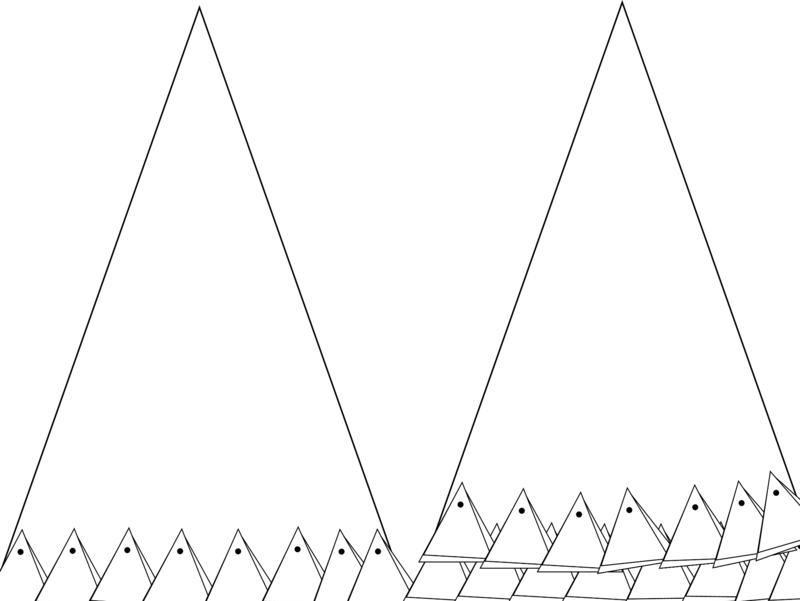 Continue around the base moving upward until you reach the top in the same method used for the avant-garde tree. Fluff as necessary.